Home > Personal Interests > Gamers Zone » Is it okay to use the generic memory but not so fancy looking green RAM for gaming? Is it okay to use the generic memory but not so fancy looking green RAM for gaming? Memory module with black colored PCB are often marketed as ‘gaming’ memory even though you’ll still be able to find those generic memory with non-black colored PCB that shares the same or similar specifications. Although these generic memory usually doesn’t comes with any XMP profile like these ‘gaming’ memory does, there are chances you’ll still be able to give it a little push for a slightly better performance if you’re using a motherboard that supports memory overclocking. 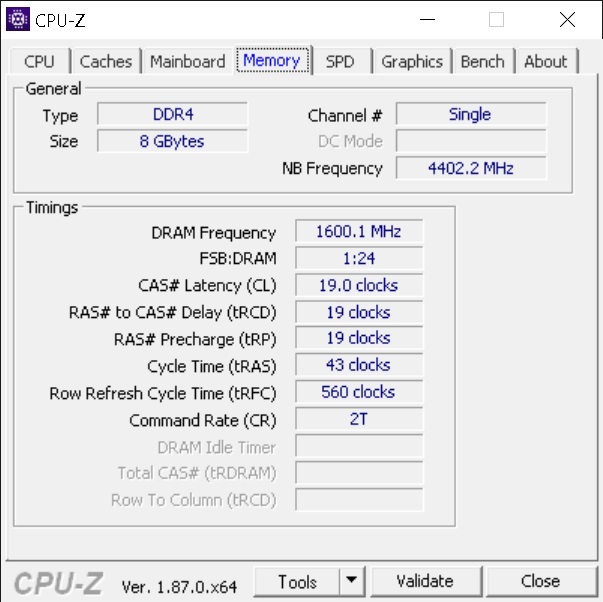 To put this to the test, we’ll be doing a quick and simple game performance test using the generic looking Transcend JetDram DDR4-2666 (JM2666HLB-8G) compare it against a gaming memory that has a 3200MHz CL16 XMP profile. 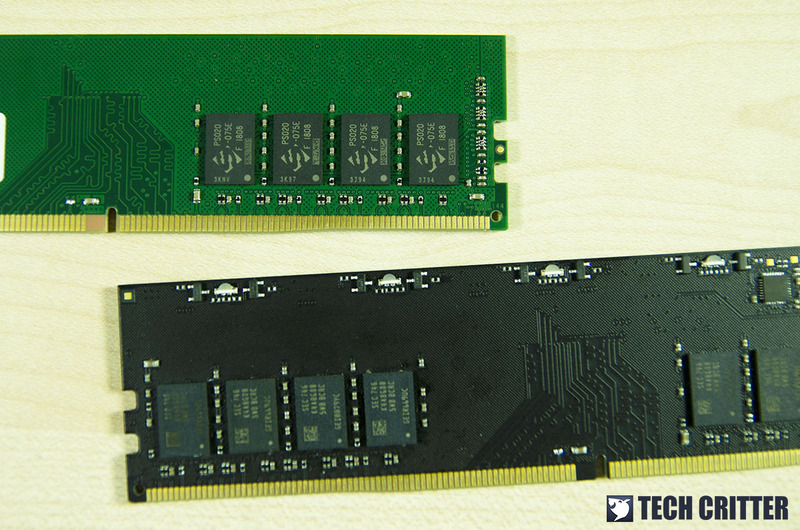 Although Samsung, SK Hynix and Micron are the commonly used memory IC nowadays, the Transcend JetRam DDR4-2666 are using the memory IC from SpecTek which can be found on quite a number of generic memory in the market. Just so you know, SpecTek is a wholly owned division of Micron Technology that develops cost effective memory solution. As for which memory IC from SpecTek are used on the Transcend JetRam DDR4-2666, we can’t really determine it using the Thaiphoon Burner as usual because these information has been removed for some reason. 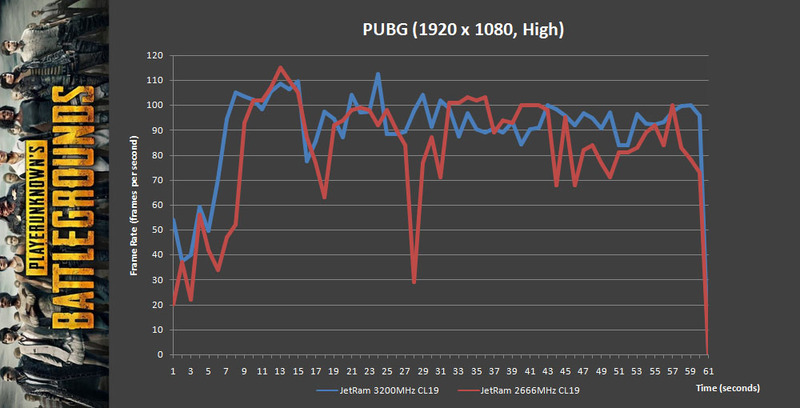 In this test, we’ll be using the popular battle royale title PLAYERUNKNOWN’S BATTLEGROUNDS to gauge the performance difference between the Transcend JetRam DDR4-2666 (stock and overclocked) and gaming memory running at 3200MHz with XMP. 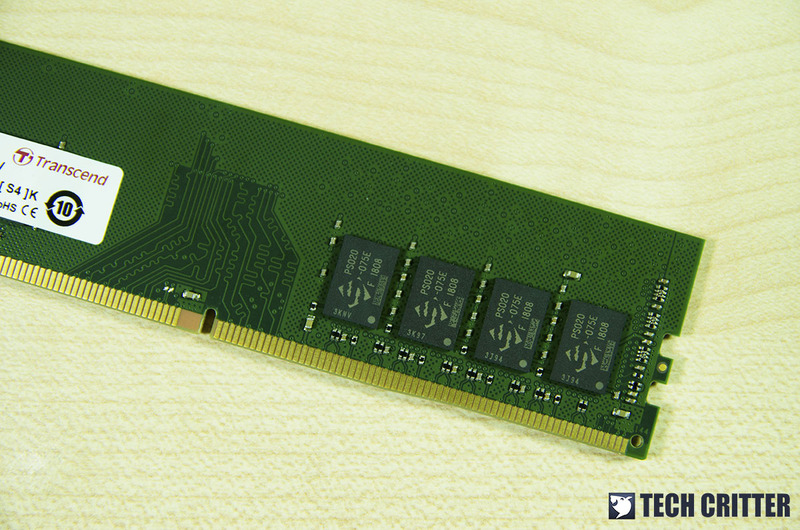 As its name suggests, the Transcend JetRam DDR4-2666 runs at 2666MHz CL19. Despite its generic look, the specifications here are actually very similar to quite a number of ‘gaming’ memory in the same category. For our gaming memory, we’ve enabled the XMP profile so that it runs at its factory optimized speed and timings. We’ve confirmed that it’s actually using Samsung B-die memory IC, but the one we have here is a 3200MHz CL16 kit. It’s not exactly the highly sought after 3200MHz CL14 that enthusiasts are looking for. While the difference in average fps doesn’t seems to be very significant, the effect of having a higher CAS latency can be seen in the minimum fps recorded. The data are then populated in a frame time graphic so that we can get a better idea on how the game behaves under different memory frequency and CAS latency. At a seemingly more than playable average 82 fps, the stutters caused by random fps drop and spike for certain scenes can be a problem if you’re playing competitively. We settled down with 3200MHz CL19 for the Transcend JetRam DDR4-2666 without any adjustment to the timings and relevant voltage, but that’s pretty much we can do for now. Tightening the timing doesn’t seems to be a good idea because we ended up with an unstable system for going lower than CL18. We’re able to run the game with CL18-18-18-39 2T but it yields very minimal difference in performance and random BSOD still happens once in a while. 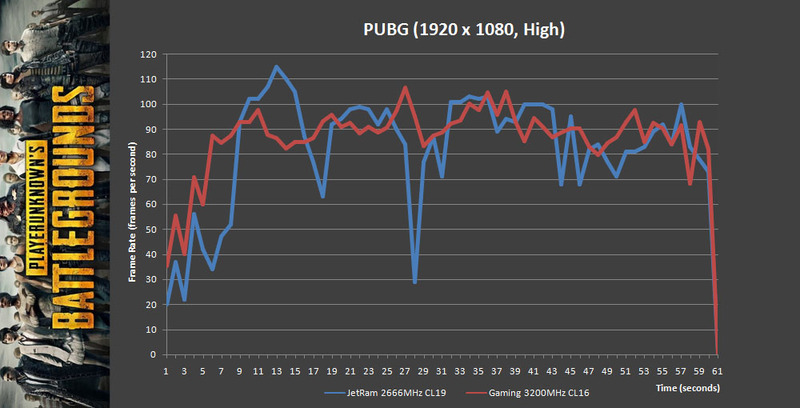 Although the raise in average fps after the overclock seems to be very minimal, the minimum fps recorded almost doubled and that really improved the game play in overall. The game play are noticeably smoother even though random stutters still occurs in more complex scenes. By comparing the before and after result, we’re actually getting a more consistent frame rate after the overclock. 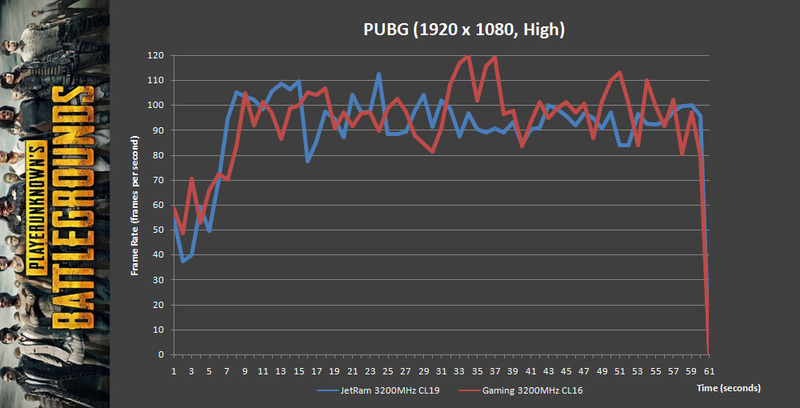 As we’re actually getting a good gain in speed without sacrificing the latency, the fps drops and spikes doesn’t goes as crazy on the 3200MHz CL19 as compared to 2666MHz CL19. We then compare the result for both memory running on 3200MHz to see what kind of performance gain are we getting despite the difference in the CAS latency. By having the same latency but higher speed, we’re able to achieve a pretty decent result with the Transcend JetRam DDR4-2666. The better representation of reduced performance gap can be seen in the minimum fps, which is now 36 instead of 20. That’s a 80% increase as compared to the 2% increase in average fps. In the frame time graph above, we can see a much more consistent frame rate for the Transcend JetRam DDR4-2666. It’s not exactly performing on par with the gaming memory running at 3200MHz CL16 of course. At least we can see that it’s much better than what we’re getting from 2666MHz CL19. To put it simple, a much more playable game in overall. Here’s something to clarify before we wrap things up – we’re not trying to prove that any brand is more superior than the other. It’s more of showing what you kind of performance you can draw from a generic memory that is not marketed as a ‘gaming’ memory. These generic memory might not be using any of the memory IC that you will normally find on a ‘gaming’ memory that has a pretty good headroom for overclock, but you still can give it a slight push if you’re using a motherboard that allows you to overclock your memory. 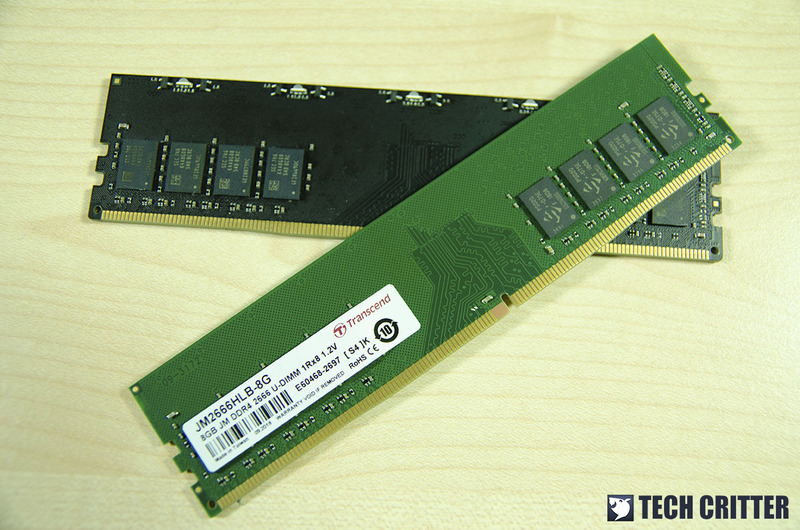 For the Transcend JetRam DDR4-2666 we have here, it’s more of a memory kit for those who wants reliability for work instead of the performance for gaming. Because of this, they’re usually comes at a cheaper price – Transcend JetRam DDR4-2666 are priced at RM 249, that’s like almost RM 50 cheaper than some of the value ‘gaming’ memory you’ll find in the market. If you don’t mind the generic look, these generic memory will still get the job done just like your value ‘gaming’ memory, but at a lower cost.